The WIT Technology is being used in a clinic located in Hollywood, FL. 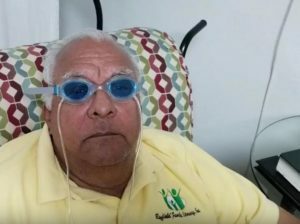 Dr. Walter “Buck” Campbell, DAOM, continues to add the Polarized Water with his proprietary combinations of Chinese herbs to create homeopathic eye drops. He has witnessed several of his patients experience visual revival in his clinic. The bell weather patient was a woman that was our December 2016 Aha! You may recall that she painted her fingernails green to re-train her brain to discern the color of green. She is thrilled that she is no longer “living in a white cloud” and now can see our beautiful colorful world. Dr. Buck recently told us her vision continues to improve with on-going therapies. Many of us are or will be experiencing some form of vision impairment … having concerns about not being able to drive to the grocery store or no longer being able to see the faces of those we love. There are theories that the cause of certain vision impairment may actually be viral related. Dr. Buck told us about a another type of case, that may not be viral but rather one of toxicity starting with her liver and traveling to her cerebral region. The woman’s vision had degraded over time such that she could no longer see her husband’s face. Her former military husband cried tears of joy when she told him that she can see his face again after Dr. Buck performed an acupuncture treatment and added a few drops to her eyes. Dr. Buck drives six hours round trip, at least one weekend each month, to load cases of Watt-Ahh® into his car so there is a supply available for his patients. I think he also likes to discuss with Rob the energy potential of nature-based healing before heading back across the Everglades. On his last visit, Dr. Buck told us about another patient who could no longer see the color of red. When he moved the card, she was excited to see a flash of red. His theory is that the patient’s ability to regain color vision may occur within the second layer of the visual cortex which is more likely to detect movement. Instead of staring at a grid with a static dot as shown in a t.v. commercial, Dr. Buck plays this video while working with his patients who want to revive their ability to see colors. In February of 2018, Dr. Buck posted this video testimonial of another patient with vision issues. In April of 2018, Dr. Buck provided a written protocol that is available at this link. Do you suffer from dry eyes? Tip: Rob and I use 360 spray misters that we purchase at either a local Sally’s Beauty Supplies store or on-line. Add Polarized Water to a clean spray mister and mist your eyes. It may refresh your eyes and make them feel moister. Also, since the lens are more hydrated, it may support improved visual clarity particularly while driving at night. We are also aware of a number of individuals concerned about the health of their optic nerve whom either use eye drops or lightly mist their eyes with the Polarized Water, and they report to us some positive results.